Perfect location,nice and clean apartment,everything was very good. Miss Eva and her sister were very kind and helpful. 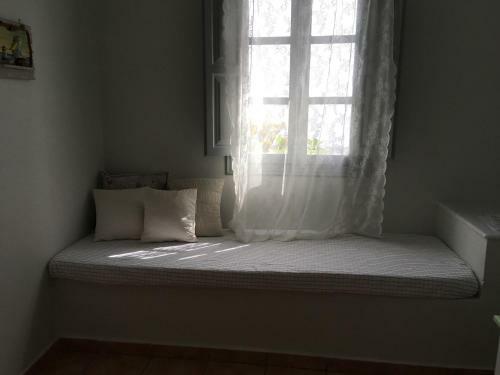 Very nice, comfortable and with a great view to he sea. 10 minutes walk from Fira. Friendly and helpful staff. The hospitality of the owner was great; she was really helpful and willing to give us extra info about our stay in Santorini. The location was perfect; at a walking distance from Fira but at the same time far enough from the noise. We also enjoyed our view from the balcony to the sea. Last but not least, our apartment had a well equipped kitchen, which I consider very important for family vacations. Alonia Studios is a value for money choice, considering the standards of Santorini, which is one of the most expensive greek islands. 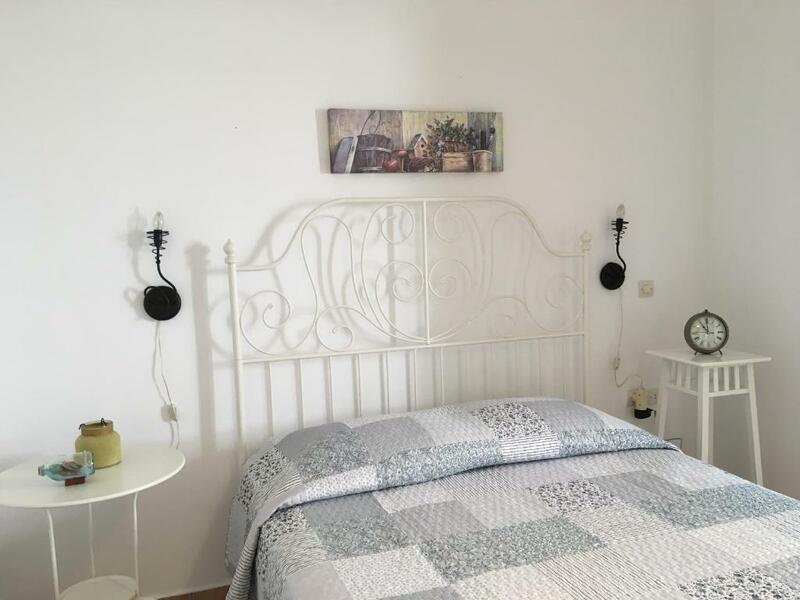 Nice staff, good location to reach famous St Theodori church and reasonable price for spacious room. Loved the location. Just a short walk from the hustle and bustle of Fira. Our host was amazing, she was really helpful with everything. We arrived close to sunset, and she gave us all the instructions to get a nice view. This place has a very friendly host which can be a rare commodity in the greek islands. She was very vibrant and always ready to help. She gave us maps and great advice. The view from the top floor studios is awesome!!! Really romantic. And lasts but not least, the room was cleaned every single day with all sheets and towels replaced. Another rare commodity. The room was absolutely adorable and Eva and her daughter were so sweet and accommodating. It's located in a convenient part of town within walking distance from restaurants, bus stops, entertainment, etc. It was the perfect location, and the price was extremely reasonable! I will DEFINITELY stay here again! Easy walking distance from Fira. Apartment very clean and spacious. + The staff could not have been more helpful or polite. They got info about things fur us to do, arranged transportation, and extended our check out time. The place was sparse but very clean, the rooms big and the location was excellent. We had a great little deck outside our room with a terrific view. 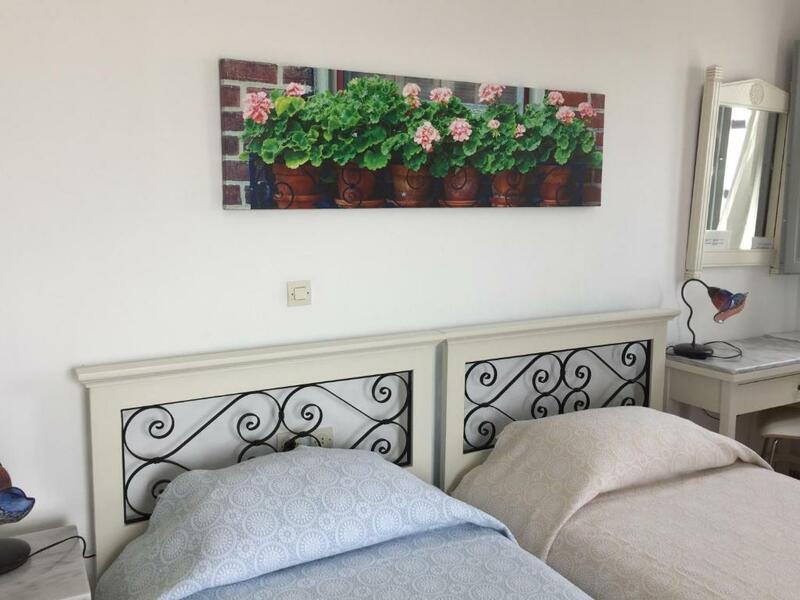 Lock in a great price for Alonia Studios – rated 9.1 by recent guests! One of our best sellers in Firostefani! The traditional complex of Alonia Studios is located in Firostefani of Santorini, just 1,300 feet from the lively Fira and 650 feet from restaurants and bars. 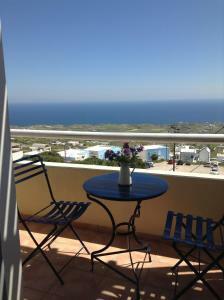 It offers studios with free Wi-Fi and panoramic views over the Aegean Sea. The minimally decorated, Cycladic-style studios of Alonia have a well-equipped kitchenette with fridge and cooking facilities. Each unit comes with air conditioning and a TV with satellite channels. You can enjoy the famous sunset of Santorini within 650 feet from Alonia. The bus to Oia stops just a few feet away. The Cultural Center Megaro Gyzi, where various events take place, lies within a walking distance from the property. Room and car rental services can be provided and free public parking is available at 150 feet. When would you like to stay at Alonia Studios? This elegantly decorated, Cycladic-style studio opens to a balcony or patio overlooking the Aegean Sea. It offers air conditioning, free Wi-Fi and kitchenette with cooking hobs and fridge. Spacious, Cycladic-style studio with a private balcony overlooking the Aegean Sea. It is fitted with a built-in bed and a traditional sofa and offers air conditioning, free Wi-Fi and kitchenette with cooking hobs and fridge. Located on the ground floor, this studio opens to a furnished patio enjoying unobstructed Aegean Sea views. This traditionally built and air-conditioned studio opens to a terrace with Aegean Sea views. It features a kitchenette with hobs and mini fridge. Free WiFi is provided. House Rules Alonia Studios takes special requests – add in the next step! Alonia Studios accepts these cards and reserves the right to temporarily hold an amount prior to arrival. Please note that the owners can arrange transfers upon charge. Please inform Alonia Studios of your expected arrival time in advance. You can use the Special Requests box when booking, or contact the property directly using the contact details in your confirmation. it's too cold in the room and water is not warm enough. room is big and near the blue church. Little chill room but heater can cover it. The pin on location, it was not accurate enough. Had therefore very hard time to find the place. The host, apartment and location. Very clean and calm, 2 minutes walk to beautiful caldera sunsets, great staff willing to accommodate guest requests, functional kitchen, comfy bed. Very good for a short stay. I can't fault the property but there are always some things that can be improved upon. A small example is bottled water. The tap water in Santorini is not recommended for drinking and we got a free bottle of water on the first night. However it would have been appreciated to get one each day as the daily room charge was the same each day. The location is excellent, just a few minutes walk along the pedestrian-only route to Fira (town centre). Also just a short stroll to a great sunset viewing area in Firostefani. Extra bonus is that you can also see sunrise from the room. We enjoyed having our breakfast on the spacious balcony (unit 6) with the sunrise each morning. No criticisms. You could say the apartments are basic, but that is reflected in the price, and you know what to expect from the pictures. I suppose one minor gripe would be its proximity to the main road leading to Thira, but for getting around, this is extremely handy. Alonia Studios is an excellent place to stay in Santorini. Our room was clean, welcoming, and ideally located in Firostefani, situated a few minutes walk to all of the local bars and restaurants. Eva was an extremely friendly and helpful host, embodying the legendary Greek hospitality. Having stayed in more expensive apartments on the island, we were really impressed with this one. 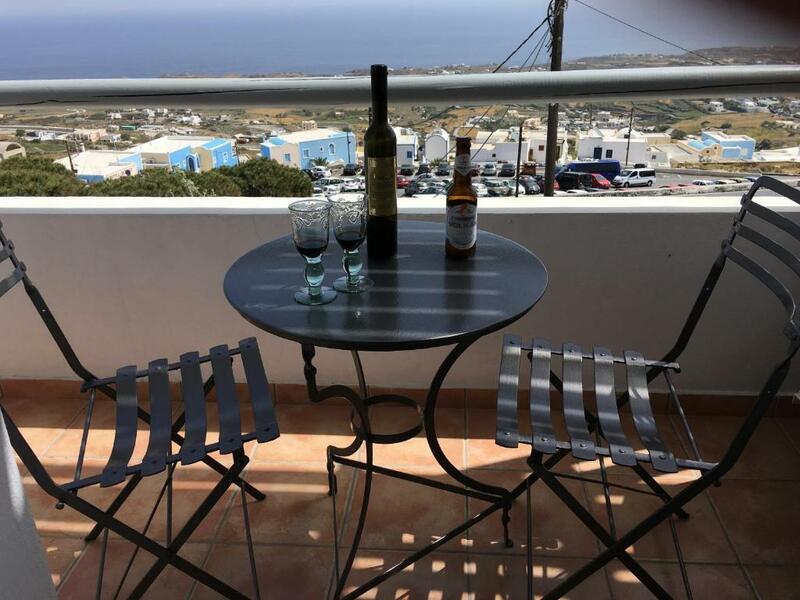 Whereas you are not over looking the caldera directly (you are a couple of streets back), you are but a short walk to all of the local amenities. As a result, the price to stay here is far cheaper than it would be if it was perched right on the edge, overlooking the sea (another apartment we stayed in with a caldera view cost 5X as much, and was remote compared to this one). This is the perfect place to stay if being close to all of the best eateries and shops is your priority, and you are less-concerned about having the sea view. We would visit again. Recommended! I have no complaints at all. It was very good value for the money. The hosts were extremely helpful with recommendations and directions. The room was very clean and the location perfect. Very close to Fira and very walkable to many things. No negatives regarding the property but Santorini airport is appalling, the worst I’ve ever been to. Any form of organisation would have been a bonus. Equally bad for arrivals, only one guy on passport control, with all passengers corralled into the same area for all departures. A real shame because it spoils the overall Santorini experience. Great location and property. Right next to footpath for easy access to Fira in one direction, and Firostefani and views of the caldera in the other. Fira bus station for access to the rest of the island is only 10 mins walk. The apartment could be a bit noisy at times. There was no microwave (which would have been useful) and there was an annoying safety light in the apartment which was quite bright at night! 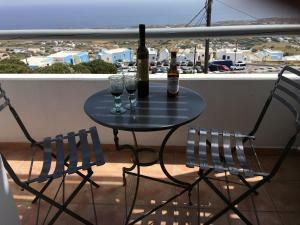 Friendly and helpful staff, good location close to Firostefani and Thira, clean accommodation, regular maid service. Location was excellent. Apartment was very clean and was serviced daily. Very clean, comfortable, the owner and staff were very friendly and helpful. The host was amazing, giving us great tips of what to do around the island. The location was good, no sunset view but a short walking distance from the great views and a little more quiet. We had a view of the sea from our apartment which was nice. Very spacious apartment with a little kitchen area giving you everything you need for a perfect stay!